While it's not always obvious that your child is a wise man, everyone has a sage personality in there somewhere. So just remember when your child is out there pushing on a door that says pull, sooner or later he's going to say something groundbreaking that will make you recognize the importance of family. And yes, he somehow manages to leave his socks in every room of the house while also having to be reminded to change his sock every day. Hmm, maybe that in itself is a type of wisdom. Anyway, maybe all you need to do is get your child in touch with his wise side. 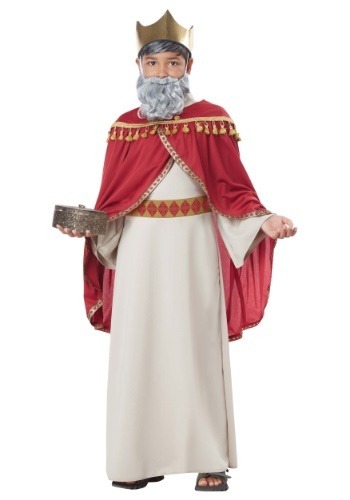 This costume is perfect for church plays and Nativity celebrations! The cape is rich with tassels and a deep red color that is sure to make your kiddo feel like one of the three kings. The robe secures with a hook and loop touch-strip fastener at the neck so there is no need to fool around with buttons. Topped off with a fabric covered foam crown and your child will be ready to spread his astrological wisdom. Your child is no standard king, he's a king with a clue. He's on the up and up. There's no way he's going to ignore important signs like a bright star that's calling him to find a holy infant. Lucky for him, he doesn't have to go it alone! He can pair up with two friends and form the wise trio that we all know and love from the big book. And while he might be honing his wise ways we can't promise that he'll stop leaving his scosks everywhere. He's got other important things on his mind! Needs more bright colors. Good material.